Trinamool supremo and West Bengal Chief Minister Mamata Banerjee today confidently declared that she will form the government in Tripura in the 2018 Assembly polls. 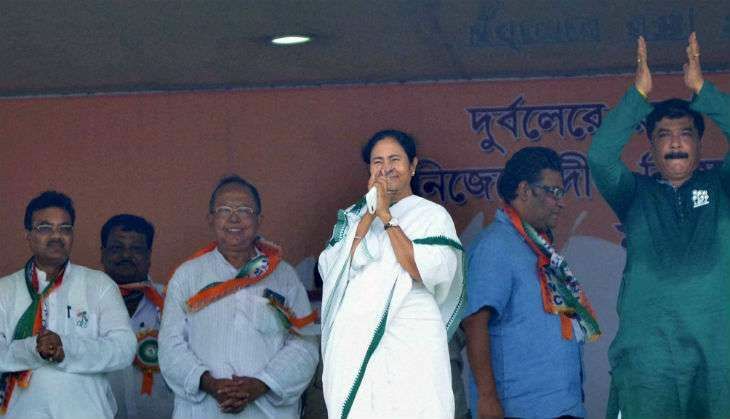 She added that Trinamool Congress leaders will extend their support to form the government. In her first ever public meeting in Agartala, Mamata Banerjee's speech was peppered with how the time has come for "poriborton" in Tripura after 23 years of CPI-M's "misrule". She made it abundantly clear that she was laying the grounds to contest elections in the state. Reacting to the increase of chit fund companies in the state, Banerjee claimed that in Tripura, around 142 chit fund companies have been set up and the Left front government has failed to take action against any one of them. She also gave an assurance that if her party comes to power in the state, action will be taken against the chit fund companies. The West Bengal Chief Minister also criticised the BJP government for trying to stoke communal tensions in the state and said the BJP is only concerned about Delhi. She added that whenever the Trinamool Congress opposes the BJP in any manner - when the state government criticises some of the Centre's policies - they intimidate the party with a raid. Banerjee also pointed out that though the BJP routinely threatens the TMC, it was due to the latter's support that the Centre's GST Bill was passed in the Rajya Sabha and Lok Sabha. As the TMC doesn't have a base in Tripura, Mamata Banerjee and her party are trying to foray into the tribal-dominated state through various means. She has entrusted her lieutenant, Mukul Roy, with the task of expanding the party's base in the state. there are no jobs or industries in Tripura and that during the Left's 23-year-rule, not even a single super-specialty hospital has been set up in Tripura, as opposed to the 41 super-specialty hospitals in West Bengal.